Several surveys and documentation activities had been conducted before our project and for the matter of complex information, it would be important to summarize them. A prominent survey had been performed by architect Eugen Bárkány during the 1960s (Bárkány, Eugen-Dojč, Ľudovít: Židovské náboženské obce na Slovensku. Bratislava 1991), when many synagogues were still standing. The cemeteries had been less overgrown by vegetation or plundered by the locals. Although outdated, this survey remains the most authoritative and often consulted. 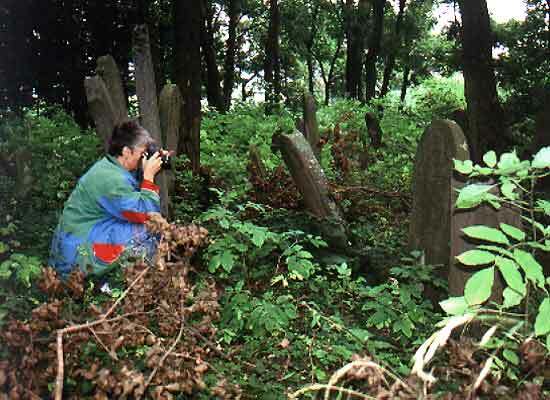 Several surveys from the 1990s are available: by the US Commission for the Preservation of America‘s Heritage Abroad, a private survey of cemeteries by the Slovak Jewish Federation, and an unpublished survey of the National Monument Office conducted through their regional offices. The last one we consulted for our project. In the late 1980s and 2002, Rivka and Dr. Ben-Zion Dorfman of Jerusalem traveled Slovakia within the framework of their documentation project of European synagogues (Dorfman, Rivka a Ben-Zion: Synagogues Without Jews: And The Communities That Build and Used Them. Philadelphia 2000). Well known are the activities of a Bratislava-based physician Tomáš Stern. Finally, the most recent activity has been conducted in summer 2003 by the ICOMOS Israel with work done by the Israeli students in three Eastern Slovak cities of Košice, Prešov and Bardejov. We mention previous activities to give them credit for their work, since our documentation project has no ambition to compete with either. Synagoga Slovaca had been launched in summer 2001 as a joint-project of three Slovak institutions: Institute of Jewish Studies, Comenius University, Slovak National Museum – Museum of Jewish Culture and the Faculty of Architecture, Slovak Technical University. It is a systematic, detailed documentation project, conducted by the local Slovak institutions, with project results archived in Slovakia and thus allowing future accessibility to the local public. Additionally, researching and promoting Slovak Jewish heritage, we are dedicated to be instrumental in setting longer term strategy of preservation of this endangered heritage. Our methodology had been inspired by various researches by our colleagues, while adapting them to local conditions and shoestring budget. Two publications have been of prominent interest for us: Hammer Schenk’s opus magnum about the synagogue architecture in Germany and research of Hungarian synagogues conducted by Anikó Gazda et al. in Hungary during the 1980s. Understanding the nature of the Slovak material, where over a hundred buildings had been physically preserved, but minimal archival documents available, we had to develop a strategy of obtaining full measurements and plans of these buildings. Since our project means had been from the beginning very limited, we knew that it would be impossible to rely on work of professional architects. Therefore, we adopted a scheme used in a joint project of the Center for Jewish Art in Jerusalem and the Technical University in Braunschweig, which is based on student work. Maroš Borský had been introduced in detail to this project by Professor Aliza Cohen-Mushlin, during an internship at the Center for Jewish Art in Jerusalem in 1999-2001. In addition, he also visited colleagues at the Technical University in Braunschweig, Germany. We decided to model our documentation project, Synagoga Slovaca, on this successful German-Israeli project, and developed a fruitful cooperation with the Faculty of Architecture in Bratislava. After five years of working with students, we can conclude, it proved to be the most suitable and really cost-effective solution. The project had two goals: documentary and educational. Identification. This step was an important prolog; we have spent summer 2000 evaluating information available at the archive of the National Monument Office in Bratislava. We studied results of Bárkány’s survey from the 1960s and compared it with survey conducted by the National Monument Office during the 1990s. Reports of regional branches of the NMO are preserved in archive, though this research was never published. Based on this archive work, we compiled a list of over hundred synagogue objects spread through the entire territory of Slovakia. While planning visits to sites, we had to identify dozens of current owners, users or wardens of former synagogues. Negotiating free access had been a very delicate process. Photographic documentation. Hundred-five synagogues and prayer halls have been systematically photo-documented in detail: for slides and digital images by Maroš Borský, while the museum photographer Viera Kamenická, an experienced documentarist of architectural monuments, photographed for prints. By now, we visited and photo-documented all identified buildings of former synagogues and prayer halls. This task we divided into two field trips (summer 2001, summer 2002) with the team consisting of the photographer, Borský and two colleagues from abroad: Dr. Samuel D. Albert (Hebrew University of Jerusalem) and Dr. Janez Premk (Ljubljana University). In addition, objects we did not manage to document during these major campaigns, we visited with the photographer on numerous short trips from Bratislava and Košice. Further processing of field trip results. The buildings‘ architecture was analyzed and described, using on the spot sketches and photo-documentation. Thousands of print pictures taken by our photographer were scanned at the Museum for future digitalized archive. Archive research. During the fall of 2005 we completed the archive research in Slovakia. Mostly searching for original building plans and historical documents, serving concrete attribution of buildings and exact dating, this stage of project was due to complicated conditions in post-Communist archives one of most difficult stages. Research of historical images. For purpose of our knowledge about heavily altered or demolished synagogues, we had been in touch with numerous regional Slovak museums, important museums abroad and various private collectors. Important feature of our project has been cooperation with Professor Matúš Dulla from the Faculty of Architecture, Slovak Technical University in Bratislava, and his team. For the Faculty we developed a specialized seminar on synagogue architecture taught as an elective. Its purpose was to educate students to treasure synagogue architecture as a part of Slovak multicultural heritage. The students, generally group of about twenty participants, delivered as their semester task measurements and documentation of certain synagogue object, which had been previously photo documented by us. Plans at a scale 1 to 50 will be archived at the Slovak Jewish Heritage Center and will be in future accessible for scientific public. A group of advanced students under guidance of Professor Dulla processed these plans for catalogue/publication purposes. Study course on synagogue architecture was also held at the Department of Art History of the Comenius University, Bratislava. Later, we also provided a specialized course on Jewish art, which historically the first inclusion of the Jewish heritage theme into the university curriculum in Slovakia. In February 2005, we presented a bi-number of the academic journal Architektúra a urbanizmus dedicated to the synagogue architecture in Slovakia. The publication contains studies resulting from the project supported by the Grant Agency of the Slovak Republic for Science VEGA number 1/9054/02. This joyous occasion was also an opportunity to award the Chatam Sofer Medal to Professor Matúš Dulla. The medal is awarded by the Museum of Jewish Culture to distinguished individuals for their contribution to preserving Jewish culture in Slovakia. An important element of the research project was the doctoral study of Maroš Borský at the Hochschule für Jüdische Studien and Ruprecht-Karls-Universität in Heidelberg. This was successfully completed in September 2005 by defense of the doctoral dissertation „Synagogue Architecture in Slovakia: Towards Creating a Memorial Landscape of Lost Community“. The doctoral advisor was Dr. Felicitas Heimann-Jelinek; the second advisor was Prof. Dr. Michael Hesse. Since the fall 2005 we engaged in completing the data, we conducted additional architectural measurements and the winter photo-documentation of selected synagogues. From two synagogues we collected wood samples for dendrochronological analysis. In April 2006, we launched an online database of hundred-six documented synagogue buildings in Slovakia. The database presents rich documentation to numerous synagogues. The database was in meantime updated and enlarged to include documentation of ritual baths, Jewish school buildings, Holocaust memorials, selected cemeteries and other valuable Jewish heritage sites in Slovakia. The monographic book work on synagogue architecture in Slovakia was published in September 2007.